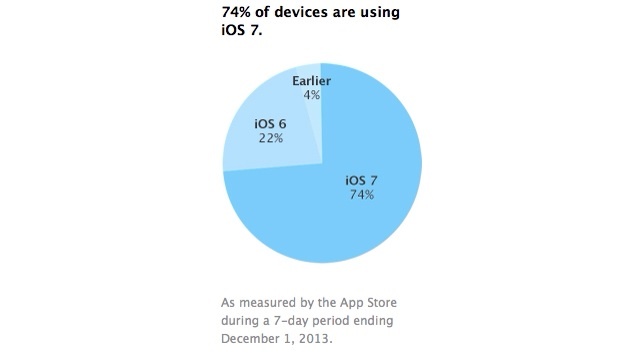 Apple has revealed that 74% of iPhone, iPad, and iPod touch users are running iOS 7. The company recently updated its App Store Distribution page to note 74% of devices are on iOS 7, 22% of devices are on iOS 6, and 6% of devices are using earlier firmware versions. The number of devices was measured by the App Store during a 7‑day period ending December 1, 2013. Notably, Chitika's recent estimates were quite close to the numbers Apple reported. Chitika said that iOS 7 usage rates had surpassed the 70% mark within North America and are on track to outpace iOS 6 adoption which reached 83% six months after its release.